Bamboo is possibly the most versatile of sustainable materials. 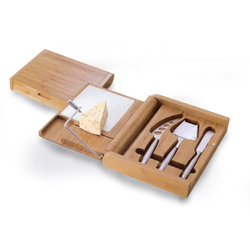 Bamboo Serveware can include bowls and trays, as well as this popular Bamboo Cutting Board & Cheese Tool Set that opens up to reveal four forged stainless steel cheese tools, a stainless cheese wire and cheese plate. $50.00 Can be laser engraved at an additional cost with a minimum of (12) units. 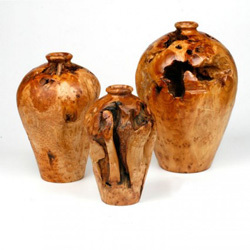 These items are carved from a species of Chinese fir. The raw materials come from stumps left by logging operations, the removal of which allows for faster reforestation. After careful cleaning & grading, each knarled stump is then transformed by skilled carvers into many gorgeous and unique items. Products shown are 10" , 12" and 14" High. For live floral arrangements a glass insert is recommended. Root wood bowls and trays are also available. Contact us for details. 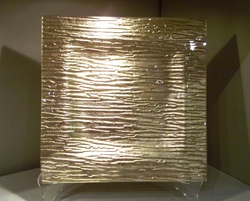 Made from recycled glass, this 11" square plate can be used for serving as well as decoration (see our Holiday page). Available in clear, smoke, as well as metallic gold, silver, red or chartreuse. 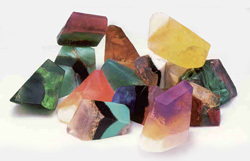 Gemstone bath soaps are a unique blend of whole herbal extracts, vitamins & minerals from aquatic, botanical and terrestrial sources that come in a biodegradable base. These treasures are endowed with extracts of earth: aloe, calendula, camomile, comfrey, lavender, vitamin E, jojoba oil, olive oil and almond oil. No animal products are used. No testing is done on humans. Bamboo is possibly the most versatile of sustainable materials. 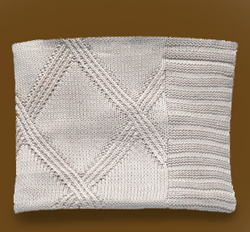 We can provide you with super soft Bamboo Baby Blankets for that super soft little one.